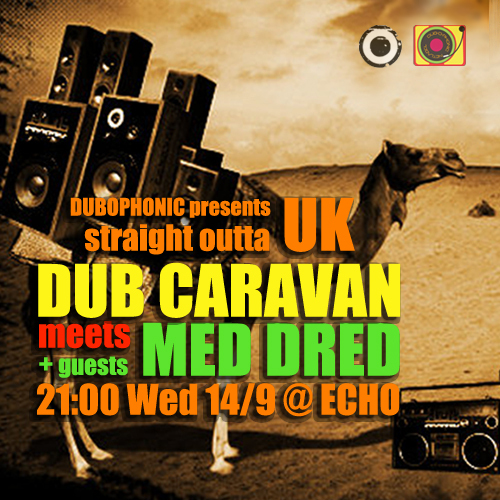 Dubophonic netlabel and Echo present for one special night straight outta UK, Dub Caravan. Being one of the leading reggae/dub producers of Europe, Felix Russ Abu aka Dub Caravan will appear for a live session on the 14th Sept 2016 at Echo in Nicosia. The artist, multi-instrumentalist, producer and composer creates multi-dimensional musical landscapes for listeners craving something fresh and original. Having worked with many world known artists like Nambo Robinson, Hornsman Coyote, Zafayah, Shaky Norman, Ras Zacharri and Haji Mike, Dub Caravan will appear alongside the Cypriot producer/Mc/instrumentalist Med Dred and will perform live, music from their new release “Dread Sea Scrolls” (digital release on Bandcamp) and also from his previous works. Conscious reggae music with a unique blend of Mediterranean and Middle East influences. Warmup session by the Unity Crew sound.